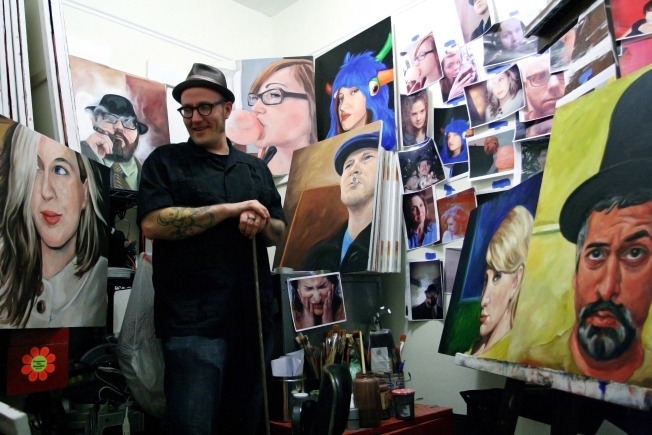 Brooklyn Artist Matt Held stands in a sea of his Facebook portraits. When 37-year old Brooklyn artist Matt Held set up the Facebook group, "I'll have my Facebook portrait painted by Matt Held," he had light expectations that it would ever grow past 40 members. Now, more than 2,200 members of the growing social network have joined, the majority presumably hoping for a portrait of their own. To be so lucky, all a group member has to do is add Matt as their friend, "so that [Matt] may view your profile picture for a possible future portrait." His "soft goal" is to complete 200 portraits of members' profile pictures, thereby creating a collection of portraits that show the "expression of an individuals' character and moral quality," exploring the complex individuals behind each photo representation. The group's sudden popularity is what really took Held by surprise. Trying to explain it to the Daily News, Matt said "I guess there's not many laymen out there that can afford to get their portrait painted," adding, "Portraiture was always for the elite, for the rich ... I'm offering to give people the photo for free and to be part of this larger project." For your shot at Facebook infamy, join the group "I'll have my Facebook portrait painted by Matt Held."